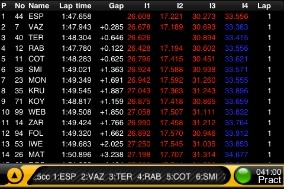 One of my must-have apps for the iPhone this year was the 2010 Formula One Timing app by Soft-Pauer. Despite its relatively high price, of $32.99 (just under 1,000 baht), when it was released I downloaded it almost immediately. I reviewed it in late March in the Bangkok Post. The lack of hesitation in buying the app was following my experiences with the previous year's version, which I had reviewed in the Bangkok Diary in August 2009 when that was released. Despite the outlay, which is mainly due to the providers of the data, Formula One Management, for someone like me who enjoys such sports, the additional information provided, particularly with split timing, made this a valuable complement to the basic television input. This Soft-Pauer offering is at a slightly lower price than the Formula One app as I speculate the charges levied for motorcycle racing data are less than for four wheels. The source of the data is a Spanish company: Dorna Sports S.L. Like Formula One Management, these are the commercial and television rights' holders. The app is set up in a similar way to its Formula One cousin with some minor design differences, obviously with the front screen graphic, but most notably in the "Info" and News sections. 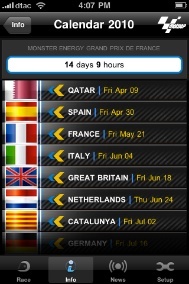 With the F1 app Info is organised with the listings, Help, Drivers, Teams, Races, Standings and Credits. 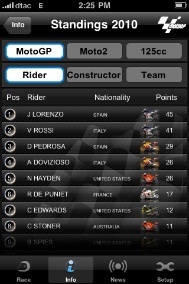 With the MotoGP app we have Riders, Teams, Calendar, Standings, Gallery and Credits. The attractive Gallery section shows 23 images for the most recent race (Spain), but only 2 (currently) for the first race of the season, Qatar. There is also a button near the top of the gallery panel linking to Paddock Girls. I find this a little sexist. Why not Paddock boys too? There are plenty of hard-working mechanics and other male support staff in racing who deserve some recognition. For me, it was an odd start to the season, as the first race ran late for those of us in Thailand and staying up until 3am with a work day following is not on for me. With the odd scheduling that Star TV uses when it comes to such sports, the scheduled rerun was replaced with no announcement, so I missed the season opener entirely. In the days when 500cc GP practice was shown, it was not unusual for me to cross Bangkok, or ride back several hundred kilometres to the city early, just to find it bumped by football, rugby, snooker, basketball, 8-ball -- all balls. The Japanese GP was postponed because of the volcanic ash from Iceland and, despite some comments on social networking sites, we can blame no one for that. For me, therefore, the Spanish GP meeting at Jerez, was the first race of the season. When I first downloaded the app, I had presumed that this was only for the top-level: MotoGP itself. However, following some online rumours, by the time I actually came to use this app, the three Grand Prix classes were included: Moto GP, 125cc and the new Moto2, the 600cc 4-stroke class which replaces 250cc GP racing. Not simply three for the price of one, but also three times the fun as for those of us who enjoy the sport, some of the more exciting racing may be seen in the lower classes. However, this is not all plain sailing. The Info section has Riders and Teams categories split into three: depending on class. Selecting an individual entry reveals more information: MotoGP, Moto2 and 12cc riders and teams included. Standings is split into Rider and Team and split again for each class. While the rider entries for MotoGP show the bikes' liveries, those for the other classes display a generic, ice-blue icon. It is early days, of course, but as one who was a teenager and ersatz-Mod in the 60s in the UK, it was nice to see Lambretta now racing. The Credits section, apart from acknowledgements to Soft-Pauer personnel and Dorn Sports, like the text that rolls by at the end of any movie, has a couple of interesting points. One of these is that anonymous data on use may be collected for statistical analysis, and there is also the useful pointer to the MotoGP App Twitter contact. Their Formula One Twitter feed was how I initially discovered this app; and it also answered one or two queries that arose out of the first F1 race this year. But heavens, the print in this section, and in some of the others is quite small. Or maybe it is the font, or the contrast. It is much easier to read the F1 app. The News section is also set out in a different manner, suggesting the types of data that Dorna Sports supplies is more varied. This is split into three: News, Commentary; and Video. The News sub-section has number of entries, each with a thumbnail image. Pressing the item, reveals a brief text on the subject with a larger image at the top. The text also mentions a related video but when I first tried this, the EDGE signal at my office was inadequate. This has been good enough for following practice sessions and races with the F1 app but the allegedly "attached video" was reluctant to reveal itself to me. In a way I am nit-picking here as this is all icing on the cake: the races. However, this may improve. The Commentary section was intriguing and I did not see this until a few days after the Spanish GP by which time it reported no live feed messages available. I will be interested to test this out as the Soft-Pauer page tells us that it provides "Live Commentary - Lap by lap live commentary (only for MotoGP race)." I hope this is the wonderfully curmudgeonly Nick Harris whose voice I hear on the TV as he features as "the Voice of MotoGP" on their website, but you will have to buy a data package to try this out. The third section here, Video, lists a number of items and clicking on a link takes us to a YouTube-like interface. My initial trials gave me sound but no video. Again, the EDGE link I use was not up to this when I tried it out, but switching to wifi later (when I could) improved things considerably and the videos downloaded and were reproduced with a good quality. 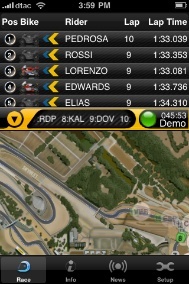 Setup is similar to the F1 app's layout with Track and Session buttons each revealing a selector wheel. The wheel for sessions, of course, is a little more complex with three classes instead of one: each has free practice (FP1 and FP2), Qualifying (QP), Warm Up (WUP) and Race (RAC). While the selection of session or race is normally automatic, this wheel may be used to download data and rerun a specific session after the event. The main sections of course are the displays of circuit and/or timing data. In Portrait mode the default is a small circuit at the bottom of the screen with a selection of riders at the top. Tapping a small arrow will expand the top section to fill the screen. In landscape mode the initial screen shows the circuit with a ticker tape news feed below. Clicking on the arrow changes to the full timing screen with the four timed sections. Within the bottom part of the screen are small display icons to show the race running conditions: green for normal, with yellow, red and a checker pattern to indicate if one of these flags is displayed by marshalls. The right side should also display the number of laps that have been run, but in the 125cc and Moto2 races these showed elapsed time. An adjustment to data transmitted may be needed here. 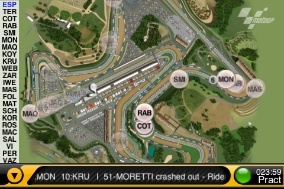 The nature of Formula One with a spread out field of up to two dozen cars and the closely-spaced large fields of riders, particularly in the Moto2 race mean that the apps may need to be used differently. While action evolves more gradually with the cars, the bikes are far more exciting on a second by second basis. 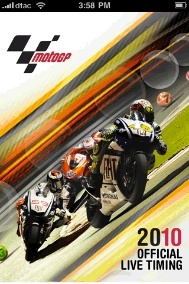 While looking at the details of this app, I read a report on the venerable Motor Sport Magazine website by Rob Widdows, who looks at the dynamic nature of MotoGP, in a sort of preview of the F1 GP scheduled to take place the following weekend at Catalunya. What Widdows misses is that the three classes of racing give excitement levels considerably higher than for F1 and my Sunday afternoons are nail-biting, whoop it up sessions with far higher levels of tension than F1 can usually muster. But we are comparing apples with oranges. However, the different concentration levels these races produce mean that the data in the MotoGP app is less likely to be used -- at least in my house -- for the constant update that I have found so useful with the F1 app. I think that the large fields also affect use. With the 1 app, times of those at the back of the field, particularly if they are normally front runners, can be easily checked with a simple scroll down. Particularly with the Moto2, those at the back are less likely to make the same sort of progress that a F1 driver can force, while we are more likely to need to scroll through two screens to find a specific rider. 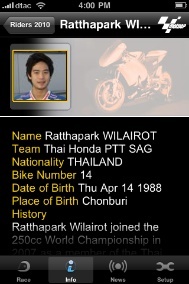 Bearing in mind that I live and work in Thailand, I like to keep track of the sole Thai rider, Ratthapark Wilairot (whose father, Christmas Wilairot was a mean racer in his day too). While I am able to follow the F1 app quite closely, the intense action and the larger amounts of data meant that I was paying less attention to the MotoGP app, at least in my early use of it. This may mean this has a greater value to those who want to view the race data after the race has been run, or for those with no access to a TV (or web) transmission of races. Another slight difficulty, coming from my use of the F1 app was that specific highlights, such as fastest rider for a section or lap or rider's best time use different display colours. This was a little confusing to begin with, but I expect this will grow on me. I was also confused with the gap display on the timing screens. This was the usual time back from the leader for Moto2 and MotoGP, but the 125cc data showed the gap between each rider. I trust that this was a problem with the flow of data for this one race and will be rectified for France. An additional problem is the simple result of the data coming from three races. The iPhone is being used for several hours and in use the screen never goes off, so the battery will drain. Downloading and watching the videos available via the news section also affects the battery. While this is expected, it means that either a full charge is needed before races start if, like me a user wants to see all races, or a power supply needs to be available. An app like this is cheap if the value to a user is proven. Although this has several differences to its more expensive cousin for Formula 1, the inclusion of all three classes of Grand Prix motorcycle racing, suggest to me that as an almost instant source of reference data this is worth having for the enthusiasts among us.